Clinic Synopsis: Shifting is a skill often reserved for intermediate orchestra classroom, but with a little fun and a few tricks, shifting can easily be introduced to your beginning strings students. This session will explore the unique challenges of teaching shifting to beginning string students. Beginning string students from Hudsonville Public Schools will be on hand to demonstrate activities, games, and exercises designed to "get 'em moving." Clinician Biographical Information Adam Davis and Sarah Maurice currently teach orchestra in Hudsonville Public Schools, a rural community located in West Michigan. 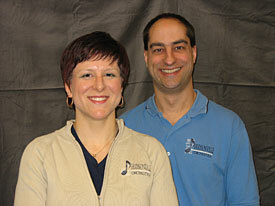 Both Adam and Sarah have taught middle school and high school ensembles. Individually, they have presented sessions and had groups selected to perform at the Michigan Music Conference, the Illinois Music Conference, and the Midwest Band and Orchestra Clinic. Adam is an active bassist with experience performing all styles of music. He is also an active adjudicator and clinician for organizations in MI and IL. A cellist, Sarah is active in several community ensembles, has been a cello instructor at the MASTA Camp, and has worked with ensembles from St. Cecilia’s Music Society in Grand Rapids, MI.